I know! I have not one, but two (!) 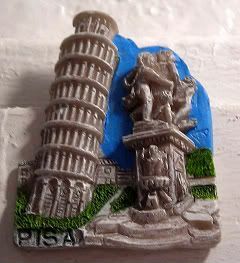 Pisa magnets! So I figured that I'd give Guest Bloggers newly wedded Save the World Couple a chance to write about their Pisa trip. I mean, hello, they totally got to visit and climb the 294 (or 296) steps of the Leaning Tower of Pisa. Also, this magnetpost finally answers the question that ALL inquiring minds kept asking me: why STWcouple decided to marry in Italy. Finally. While Joy was training it down to DC for the holidays, she asked us to guest blog for her about Pisa, Italy. The first time we went to Italy together, we used the train to get from Rome to Florence, Florence to Rome to Naples, and then Naples to Rome. We also did a lot of daytrips, including one to Pisa a quick hour train ride from Florence. When we went to Pisa, we totally took advantage of the sweet ticket deal they’ve got where you get one ticket and you can see several of the museums and attractions. Now… Pisa is NOT big and all of the attractions and museums that tourists want to see are close by. We went New Year’s Eve day along with several hundred of our not close friends. All of whom wanted to take THAT photo. You know, the photo of a person looking like they are holding the tower. Being December, we were surprised by how warm the day was (apparently, Gordon says it was “very pleasant day”) and how green the grass was. The area around the tower and baptistery is like big quad – nice, green grass (which we totally saw people making out on). On our trip into the tower, we were accompanied by a big group of Japanese schoolgirls (uniforms and all – very harajuku but with no Gwen). They were all excited about the tower and the huge bells at the top. We were too, but they were SO excited – like little Pokemons. What we weren’t excited about was the gelato in Pisa. Gordon and I were on our first venture back into the western world (as we were in Uzbekistan for Peace Corps) and we were SO excited to have pizza and gelato every day (not kidding…every. day.). However, we were extremely disappointed in the gelato that we had in Pisa. So much so, that we still talk about it today whenever someone asks us about how we liked Pisa. We CAN, however, tell you of a GREAT gelato place outside of the Vatican (we went back for more after our first round!). We were just in Pisa a few weeks ago after the wedding (the wedding of the century, in case you missed it). We took the train, again, from Florence to Pisa. And then flew from Pisa to Malta. (PS: There’s a very convenient bus right outside of the train station in Pisa that takes you directly to the airport). We intended to revisit the sites when we got back from Malta, but the weather was crap and we were still on our Mediterranean high. That first trip to Italy, however, was what made us decide to get married there five years later. It definitely has a Pisa our hearts!